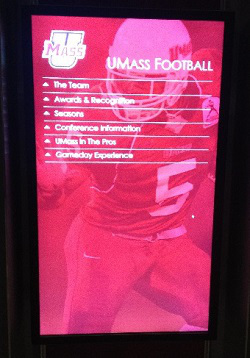 Valley Installs Digital Kiosk at UMass Amherst, which displays 130 Years of Football History — Valley Communications Systems, Inc. - Since 1945! Michael Harned, Design Engineer at Valley Communications says that colleges should work with professional AV companies when it’s time to install their kiosk. That way, they’re almost guaranteed to get a prime product and services before, during and after the installation.